Children love stories. Stories fire their imagination and make them all excited. Embedding mathematics in short stories can help children learn mathematics incidentally and grow to like mathematics as they identify with the characters and make sense of the numbers within the context of the stories. Children love it when stories are read over again especially when they are able to predict the parts that are coming up and they can read aloud to their delight as they complete the rhymes. A fun way to learn mathematics and values! 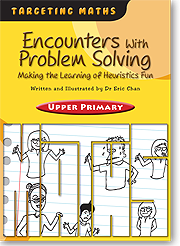 Encounters with Problem Solving is a storybook that serves to promote three main purposes. Each chapter lets children reflect on developing positive values to become better persons. A set of similar mathematical problems is included at the end of the book for children to work on as well. 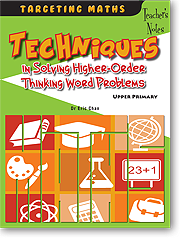 This is a resource book for teachers, parents and Primary 6 students who are interested in learning how to manage and solve higher-order thinking word problems. These problems usually require students to compare quantities, work with differences, transfer units from one item to another, match units, regroup units and/or work with common multiples in order to successfully solve them. In this respect, problem-solving strategies such as model-drawing, diagramming, tabling and listing are important tools to help organise the thinking process. This book will be an indispensable guide in learning the problem-solving strategies and techniques. Fully worked step-by-step solutions covering many of the typical challenging word problems that students tend to have difficulties with in Whole Numbers, Fractions, Percentage, Speed and Rate-Volume problems. Alternative solutions are presented whenever applicable. Tackles word problems concerning agerelated concepts, excess-shortage concepts, make-a-supposition strategy, ratio/faction/ percent transfer (Before-After) concepts and two-vehicle type of speed problems. Solve That Problem! is a Teacher’s Resource book. 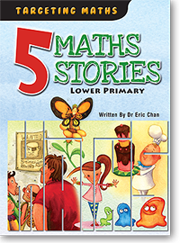 The series provides skills, strategies and expertise on how to solve mathematics problems in the primary school. 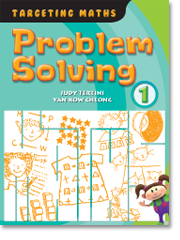 Each volume starts with an introduction to the four steps to mathematics problem solving. 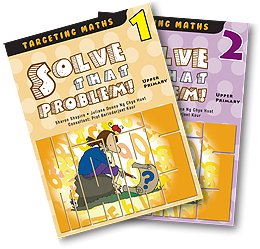 The goal of the Targeting Maths Problem Solving series is to help readers become confident and successful problem solvers, by applying an arsenal of problem-solving heuristics to ultimately solve real problems.